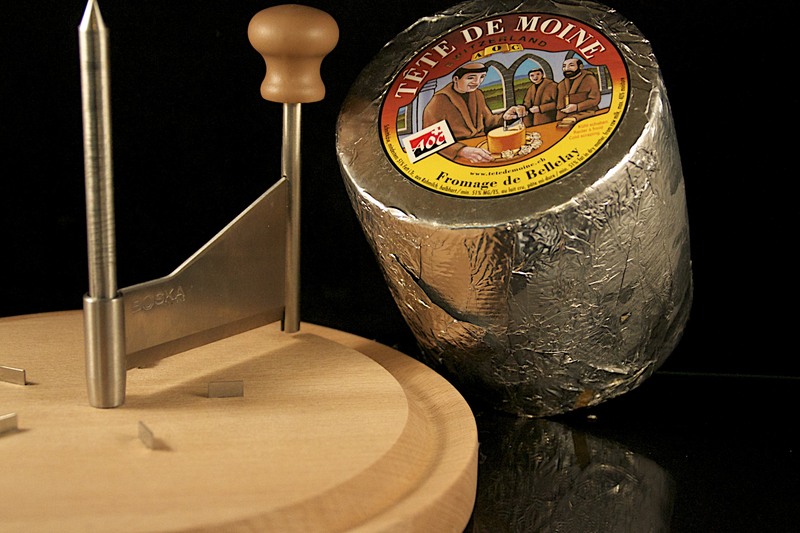 Tête de Moine is a Swiss cheese made in the French speaking region of the Canton of Bern. A semi-firm to firm cheese made from unpasturised cows milk. Tête de Moine cheese has a straw coloured yellow paste beneath the sticky rind, produced by repeated brine washings throughout the two and a half to six month maturation period. The naturally rinded cylindrical cheese received it’s name, meaning “Monk’s Head” thanks to it’s original production by monks of the Bellelay Abbey, discovered by soldiers of the French Revolution after expelling the monks from their abbey. The cheese has much heritage with the first mentions of it found in writings from 1292. Tête de Moine cheese was traditionally cut on a Girolle, a circular wooden instrument with a blade held at right angles to the cheeses surface, which shaves the cheese into petals. This process increases the air contact on the surface of the cheese, altering its body structure, and adding to its aroma. A complex full flavoured cheese, the Tête de Moine is a strong, mature cheese, but with a distinctive sweetness, allowing it to work well with both sweet and savoury dishes. The cheese has a fruity and spicy aromatic nose with a delicate soft and silky, melt-in-the-mouth texture. This cheese is really versatile, working well shaved over salads, as a great visual addition to a cheese board as girolle made rosettes, and equally tasty coupled with pepper and powdered cumin for a savoury dish, and with fresh berries as a sweet or dessert. It also melts wonderfully, as the Raclette does, over hot new potatoes and enjoyed with a dry white wine.